When the snow and ice come, people are extra diligent to look at the surface they are walking or driving on, but often ignore the overhead danger of snow and ice building up on roofs, wires, and trees. In 2010, the roof of the Minnesota Vikings’ Metrodome collapsed. Though no one was injured in that spectacular roof collapse due to ice buildup, others were killed or injured due to falling ice elsewhere that year. Here are six of the most common winter hazards, along with tips for preventing harm from them. Many homeowners are opting for the longevity and insulative capabilities of replacing old shingles with steel and other metal roofs. The slick metal can hold quite a buildup of ice before finally releasing an avalanche of ice and snow that is capable of crushing cars and people on the street and sidewalk below. Commercial metal roof systems typically seen on fast-food restaurants incorporate vertical metal protrusions called snow guards. These are staggered on each roof section and act as anchors to prevent slippage of ice and snow. Most people never notice them nor know what they are when they see them. Residential metal roof construction may not include this important safety feature. America is divided into snow load zones for roof construction. Manufactured homes have ratings stickers often placed close to electrical breaker boxes that indicate the home’s snow load rating. Older homes or homes that have had amateur roof construction or renovations completed may not be up to code for the annual expected snow fall. Years of moisture damage can weaken roof structures rendering them unsafe and likely to collapse. A minimal snow load of 20 pounds per square foot means that a 20×40 foot roof area needs to hold up an extra 16,000 pounds of ice and snow in addition to the rafters, sheathing and shingles. A roof inspection completed by a qualified inspector can determine its current snow load rating permitting homeowners to make changes where necessary to prevent a collapse. Energy conservation efforts lead to an increase in snow buildup on roofs. Better insulation allows snow to accumulate on a roof because it prevents heat loss. The eave areas often lack the extra insulation needed to prevent warming in that area. This allows snow to melt and refreeze in the gutters creating an ice dam and icicles that form spear points and weigh hundreds of pounds. 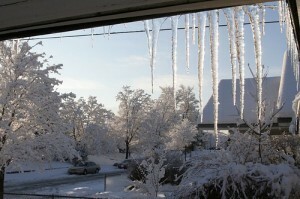 Many people have been killed by the impact of falling icicles. Companies such as Advanced Roof Solutions correct this hazard by adding insulation to eave areas and increasing attic air circulation as well as the installation of heat cables to prevent ice dams. 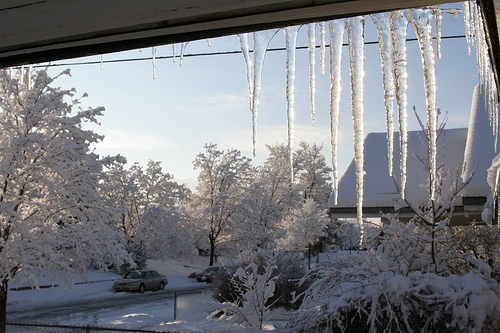 If large icicles form on a roof during the winter, it is a hazard and also a liability concern that needs to be eliminated. Many homeowners have opted to have a prebuilt garden or utility shed placed on their property, or they have taken advantage of a special offer from a company offering to build an inexpensive detached garage. However, it is critical to be certain that the buildings are designed to take the snow loads expected for the region. A roof collapse of a shed or garage can cause injury or death. However, even if no one is in the buildings, thousands of dollars of damage can be done in seconds due to a weak roof structure to vehicles and other property. Some homes have a very steep angled roof slope. New asphalt shingles may have enough adhesion to hold snow and ice in place until warmer weather melts it. As the shingles age, the gritty surface becomes smoother, which offers less of an adhesive surface area to hold snow and ice in place. Other factors such as the bright sun on a frigid day may begin to melt the layer that is in contact with the roof. This causes tons of ice and snow to slip off in seconds. If there is a risk that a snow and ice buildup will create a hazard if it falls, a roofing company similar to Advanced Roof Solutions can install snow guards to prevent it. Snow guards come in all shapes and sizes from vertical protrusions that look like decorative roof embellishments to snow rails and fences that install at the eaves. The roof structures of porches and decks of many homes attach to the house at one end while being supported by vertical posts at the other end. The posts are essentially holding up half of the weight of the roof. The floor surface of the porch or deck is all that is usually holding up the bases of the posts. Wood rot, often hidden by metal or plastic post covers, can severely diminish the amount of weight the posts are capable of holding up. The rot can be in the posts or the floor surface of the deck or porch leading to an eventual collapse even without a snow load. Each year news reports include stories of roofs collapsing after a heavy snow storm or ice storm. The evening news typically shows amateur footage of huge sheets of ice in the process of slipping from rooftops onto people and cars below, especially in areas not known to get heavy snowfall. Homeowners can protect against roof collapse and snow and ice buildup hazards by having a roof inspection completed by a qualified expert and taking appropriate preventative measures.